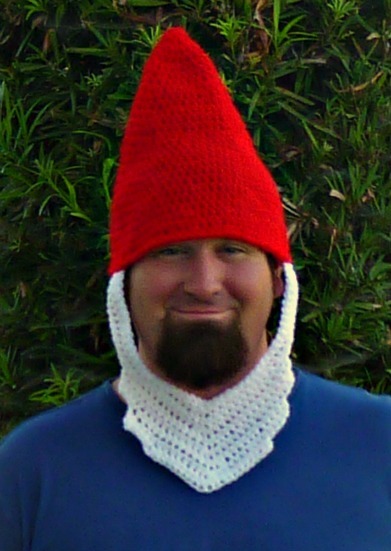 Using red yarn, stitch beard to the sides of the hat. I just used a simple running stitch. This costume rocked extra, because I was able to use yarn that I already had to make it. So basically, it was free!! And free hat costumes are the best kind of hat costumes! Poor Jake. I make him do the goofiest stuff. He is absolutely a trooper! Ooh, do you have pictures of the Minion hats? You should totally put them up! I'm sure I'm not the only one that would want to see them. Oh, Em, Gee!!! If I end up having enough time to make this after I finish the little man's costume, I am TOTALLY making this!!!! (hahaha! you may have saved my Halloween! I always dress up and I was beginning to think I wouldn't be able to this year.... sad me!) Oooohh! And, if I get really "creative" (read: decide to stay up late b/c I am insane and can't just leave it alone) I could make it into specifically the garden gnome from Amilie, and make a giant polaroid to put myself into! heeheehee! You get creative like I get creative! ETF!!! This one didn't take very long, even ripping it out a couple of times (there IS such a thing as too tall and pointy... LOL!!) 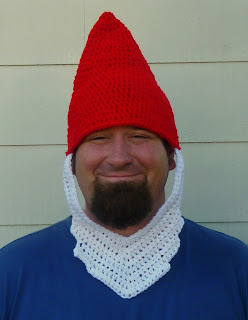 The gnome from Amilie would be adorable! Unique yet AWESOME...I love it! 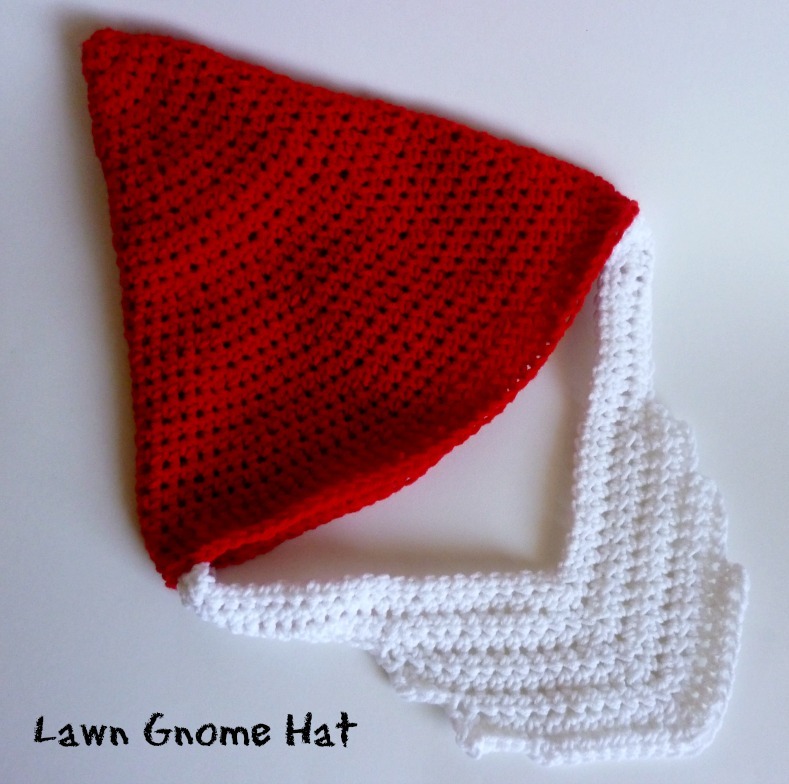 I would very much like to feature a few of your patterns on my website..starting with the Lawn Gnome! The focus of my website is to provide everything & anything crocheters look for and want on the internet. The tone is upbeat and friendly. Each pattern I feature includes your photo, a direct link to your site and is, of course, credited to you. Hi Tracy! Thank you so much for visiting my site! I've sent you an email. Yay I love it. I think it would be a fun family lawn gnome costume idea. I agree!!! You want to start, or shall I? LOL!!! Years ago my friend had the best "hat" costume. Remember the show "Home Improvement"? My friend showed up wearing a fishing hat and At first we were all confused until she raised a mini cardboard fence in front of her face. WILSON!!!!!!!! oooo that sounds dangerous for you :o) Why do they always want us to be props? Haha when my daughter was 5 she wanted to be a princess (of course) but she convinced us to dress her 1 yr old brother as the frog-prince. Well we get to the first house and they are ooo-ing and awww-ing. And the lady says to her "so are you going to give him a kiss and turn him into your prince?" to which my ever so loving daughter replies "No way he can stay a frog!" THIS IS HILARIOUS! Excellent stitching too. LOL You did good. So cool. Aww. Bummer. Hard drive crashes suuuuuuck! PAL said to tell you thanks, and that it was high time someone appreciated his suffering for my art. I think that he's only doing it to get onto one of the 'What not to crochet' sites... He's such an attention monger. I loved this pattern. I just made for friend to give her boyfriend. He is so into gnomes. Inside the case of latter, the use of a concrete slab will do sufficient to deter the dog from pursuing the dog from digging to the other side of the fence. As for moles, a deeply dug trench to put in the fence will do sufficient to hold them out why not try this out.